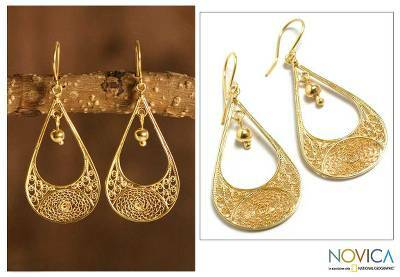 Peruvian 21K Gold Plated Filigree Dangle Earrings, "Teardrop"
Exquisitely handcrafted in the style of Catacaos, these earrings showcase the Andean art of silver filigree. Giuliana Valz-Gen creates a classic teardrop design and bathes it in radiant 21k gold. These were exactly what I was looking for, and even prettier in real life than in the photo. And nicely made. "One of my favourites--any occassion"
I absolutely love these earrings. They're good quality--they feel substantial while at the same time intricate/delicate. I just got them, but I think they could go with fancy outfits and more casual days too. Again--really beautiful, very glad I ordered these. These earrings are absolutely gorgeous! So exquisitely crafted and more beautiful than the picture!